This pane provides for control of some of the most "gee-whiz" functions on the decoder. While fine-tuning the motor is important, and speed tables help add to the realism of operation, everyone notices the lights - especially when they change intensity, flicker, flash, or fade. They attract even more attention when, for example, the ditch lights that were steadily shining as the locomotive approached the crossing suddenly begin flashing alternately, then return to a steady glow; or when a locomotive pulls into a siding, stops, and dims its headlight for the approaching train. All these effects are possible with the right decoder and proper setup, and setup is what DecderPro is all about. Every Manufacturer and decoder family handles the lighting in a unique manner, so there are many versions of this pane. The Lamp keep-alive voltage determines how dark a light gets between "full on" moments. This can let you adjust effects to give the impression of, for example, a marker light that also has a rotary beacon in the same housing. Play with this value and see what kind of results you get for your specific decoder. FX rate adjust controls how fast an FX effect operates. The higher the number, the slower the frequency of flash or "rotation" of the effect. This can be used to set subtle differences between locomotives. As you can see from the panel above, there are twin alternating strobe lights on the engines.If you vary the setting for the FX Rate slightly, the locomotives flash at slightly different rates. This keeps MU units from looking too coordinated! Ditch light hold-over time CV establishes how long the ditch light effect (alternating flashing) stays activated after you hit the F2 function key. Since the F2 key is non-latching (think of it as a momentary contact switch) that normally turns off when it is released. By raising the value of this CV you can make them stay on for up to 30 seconds from a single momentary activation. 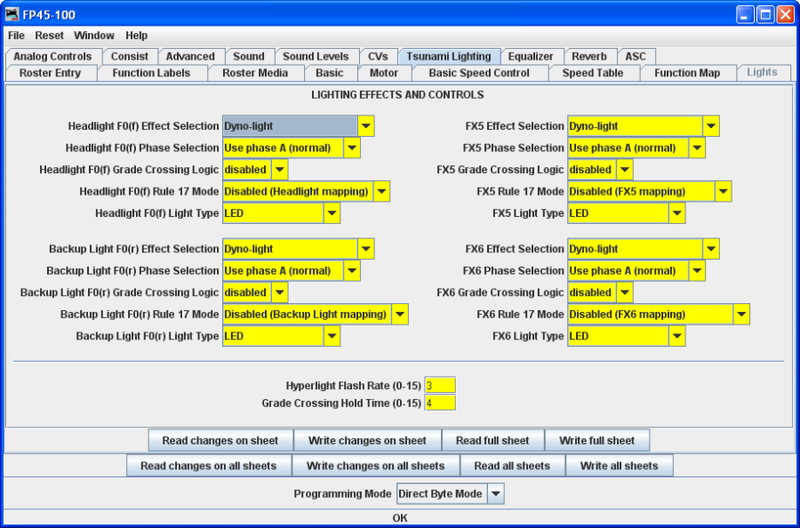 Sound decoders such as the Tsunami in our OEM FP-45 has an extremely complicated Lighting progam pane. Note that some of the lighting functions can be tied to a sound function which is unique to sound decoders. 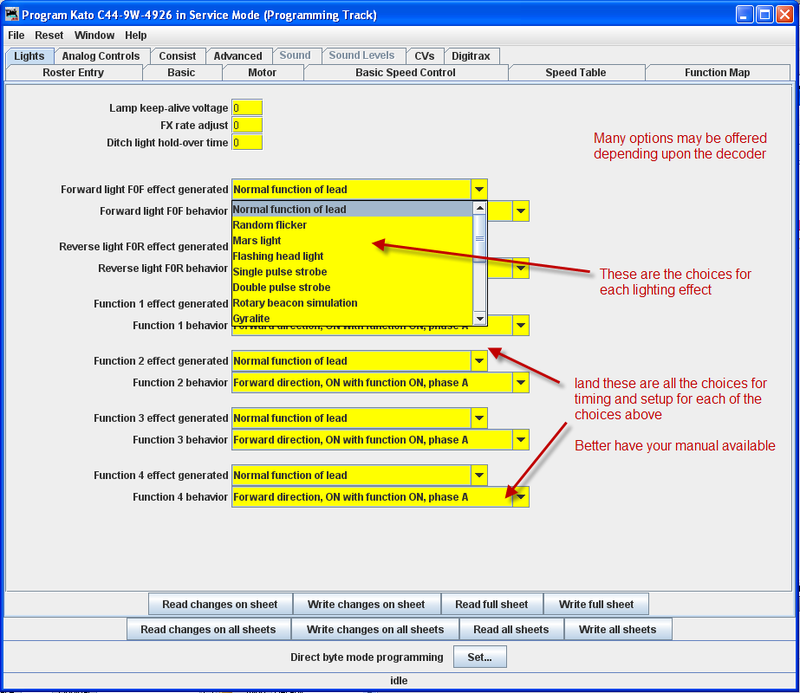 Sound decoders have many more functions than normal motor control decoders. 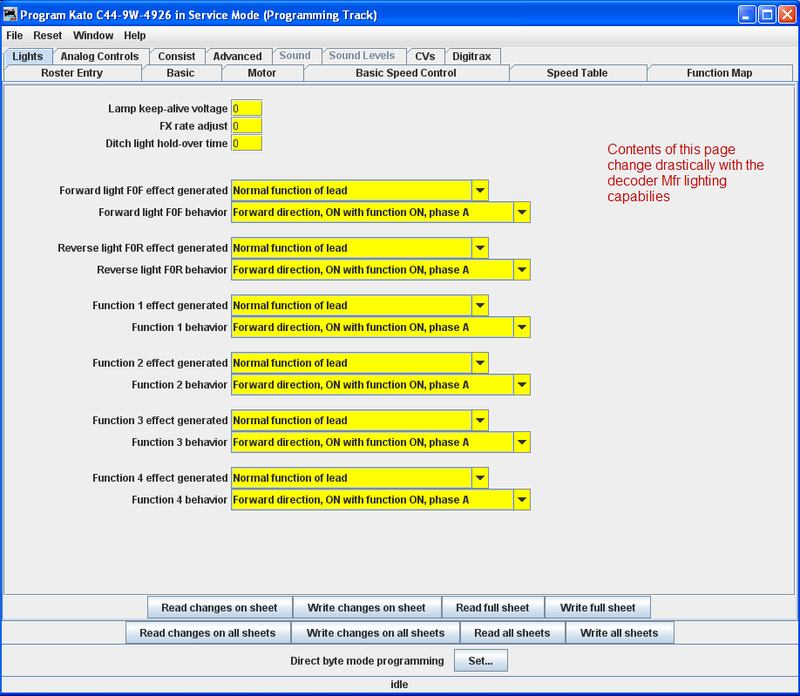 The other lighting effects are highly variable between decoders. Check your specific decoder documentation for what the decoder is supposed to be capable of doing, and have fun playing with them. They are the most visually satisfying of all the capabilities of the decoders! Even if the function and effect are available, you may have to add the lighting to your locomotive in order to be able to use that function, such as adding ditch lights, beacons, etc.